IN A SOMEWHAT turbulent week for Nottingham football partly due to the departure of Forest manager, Aitor Karanka on the opposite banks of the Trent, I took advantage of a giveaway offer of two pounds admission at Meadow Lane to watch Notts County entertain Cambridge United on this murky January afternoon. If there is such a thing as a ‘six-pointer’ this game would undoubtedly have qualified as one. The Magpies rock-bottom and propping up the entire league and the Cambridge men only a couple of places above. 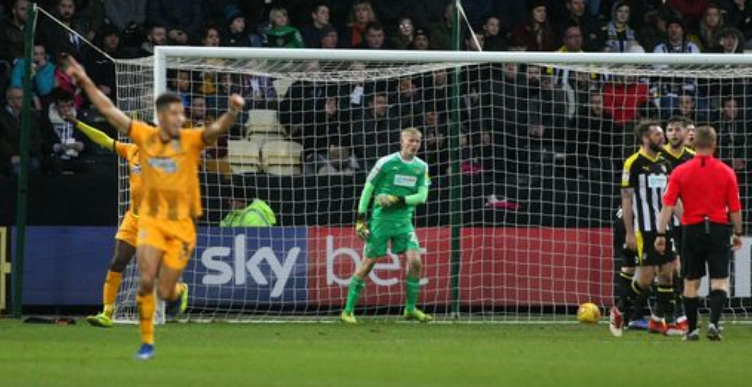 Notts desperately needed to drag their opposition deeper into the dogfight but proved unable. New signing, Jim O’Brien immediately slotted in well for the home team with the Scot giving an assured display in the middle of the park. At long last someone with the ability to put their foot on the ball and look for a pass. Someone with a little time and organisation to dictate play. A shame to say but few of his teammates took his lead. Allessandra might be excused with his neat touches but there were few other exceptions. The wholehearted Stead, a classy performer at higher levels of the game in previous seasons very much looked his 35 years all afternoon, winning few headers and generally being behind the pace of the game. Notts not only defended poorly but the rearguard continually launched the ball forwards nervously and aimlessly to no one in particular. In general, Cambridge looked the superior team all over the park, more dangerous in the box and more efficiently guarding their own. A large crowd of over 15,000, apart from the Cambridge contingent who were in fine voice, showed signs of restlessness as Notts’ mistakes piled up Conceding deep into the first half saw the Nottingham men on the back foot for the second period with a mountain to now climb. It may be recorded that despite throwing everything they could at Cambridge, the Magpies looked ineffective and not seriously looking like scoring through the second half. The crowd grew ugly in mood, especially so as they booed the players off the pitch at the close. Some reflections: I felt for manager, Neil Ardley today who cut a bewildered figure in this technical area. A man of some considerable experience with now just one win in eight games since arriving. He must be seriously wondering how to get a result out of this side. There is a despondency about the club and around the ground that is palpable. Many look resigned and almost beyond anger. I left the stadium wondering how on earth the club could pull this situation of likely relegation to non-league status around. The fact is I cannot envisage their safety. I feel that despondency for their supporters too. I truly don’t believe that they will avoid their fate. They do not have the talent, heart or ability to survive and they will deserve their fate because of this. Today, for the first time I felt truly sorry for Notts County. For over 150 years the city of Nottingham has owned two league clubs in Notts and Forest. I largely grew up with that since early days here and it is part of the fabric and culture of this city. Sadly, I fear for not too much longer.